Barb Slone | Greene County News Greene County Parks & Trails volunteers served oranges, pancakes, maple syrup and more to families March 3 at GCP&T Annual Maple Sugar Pancake Breakfast at Bellbrook Middle School. 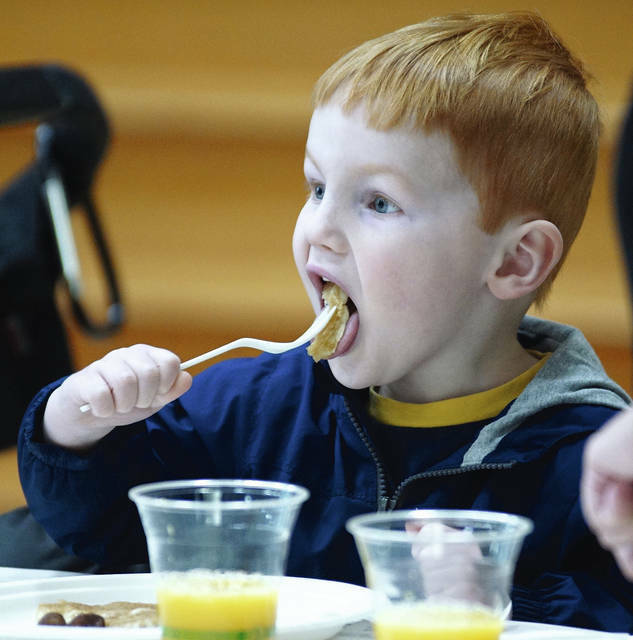 GREENE COUNTY — Families enjoyed hot pancakes and Narrows Reserve maple syrup March 3 at Greene County Parks & Trails’ Annual Maple Sugar Pancake Breakfast. The feast included sausage, oranges, milk, coffee, tea and juice. Attendees also had the opportunity to buy maple syrup and maple candy. After breakfast, naturalists led hikes in the Sugar Grove at Narrows to demostrate how sap from maple trees is transformed into syrup. Sugaring season can begin as early as late January but usually begins the second week of February and runs through the second week of March. For more information about GCP&T, call 937-562-6440 or email info@co.greene.oh.us. 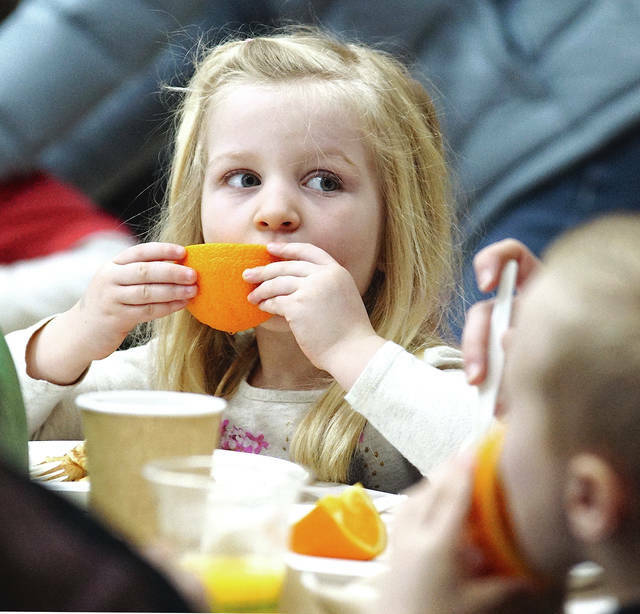 https://www.fairborndailyherald.com/wp-content/uploads/sites/50/2018/03/web1_Orange.jpgBarb Slone | Greene County News Greene County Parks & Trails volunteers served oranges, pancakes, maple syrup and more to families March 3 at GCP&T Annual Maple Sugar Pancake Breakfast at Bellbrook Middle School. 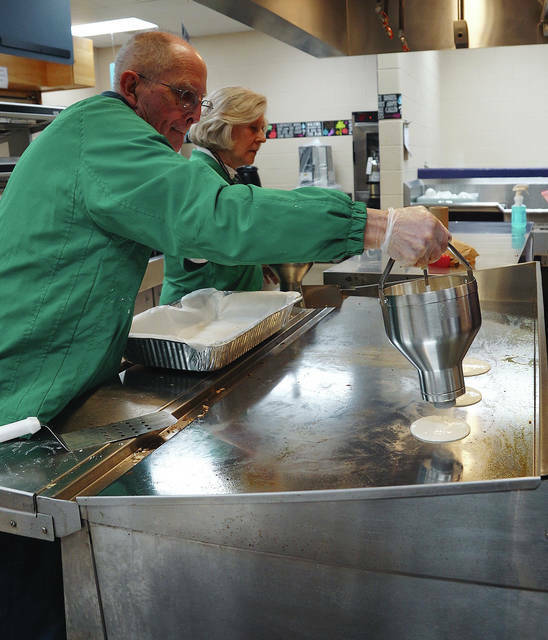 https://www.fairborndailyherald.com/wp-content/uploads/sites/50/2018/03/web1_PancakeBatter.jpgBarb Slone | Greene County News Greene County Parks & Trails volunteers served oranges, pancakes, maple syrup and more to families March 3 at GCP&T Annual Maple Sugar Pancake Breakfast at Bellbrook Middle School. https://www.fairborndailyherald.com/wp-content/uploads/sites/50/2018/03/web1_PancakeKid.jpgBarb Slone | Greene County News Greene County Parks & Trails volunteers served oranges, pancakes, maple syrup and more to families March 3 at GCP&T Annual Maple Sugar Pancake Breakfast at Bellbrook Middle School. 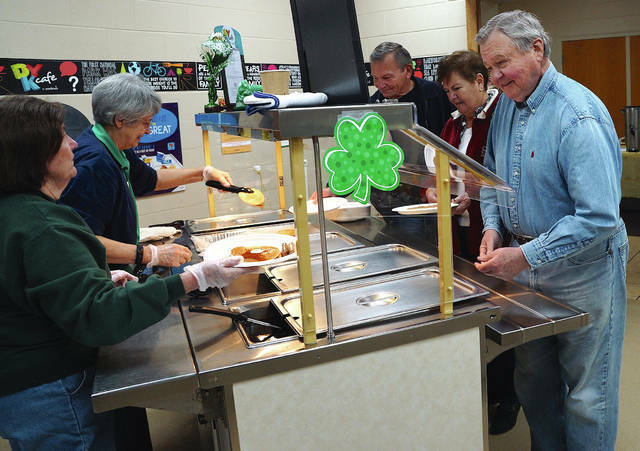 https://www.fairborndailyherald.com/wp-content/uploads/sites/50/2018/03/web1_ServingPancakes.jpgBarb Slone | Greene County News Greene County Parks & Trails volunteers served oranges, pancakes, maple syrup and more to families March 3 at GCP&T Annual Maple Sugar Pancake Breakfast at Bellbrook Middle School.